Posted May 2, 2018 by Jade Morellini & filed under City News, Featured City News. The Waterloo Estate is facing its biggest challenge since it was created in the early seventies. Threatened with demolition and re-development over the next twenty years the area gone from being a state of the art housing project to becoming a by-word for social dysfunction, but somehow it has kept on functioning. That it has survived neglect and social opprobrium is due to the strength of its community bonds. Far from being dysfunctional, residents have faced the upcoming destruction of their homes with a common goal of preserving their community as they move together into the future. “The community in Waterloo has been strengthened by the fact that Mike Baird had a thought bubble that working class Waterloo was now a trendy inner city location that could make money for his developer mates,” Jim Anderson, Waterloo Estate resident said. Meetings concerning the future of the estate have now taken on a new importance as many of the estates 2,632 official residents are determined to have a say in the outcome. “The first meeting on the first Wednesday of the month is to do with the events on the Waterloo Green through the year, and the second Wednesday is the Waterloo Welding Safety and Health Group which deals with the day to day safety of the community,” Jim Anderson said. Anderson is the representative for the James Cook Building, with the other five main buildings also having representation. “On the third Wednesday of the month is the redevelopment group which has quite a few groups working together to get the best possible deal for the future of the estate,” Jim Anderson said. “If you live in Waterloo people in the area know everyone else, and the history of the community is part of what binds it together,” Alice Anderson, co-spokesperson REDwatch said. Meetings don’t account for all spare time, as the 75 members of the three main market gardens spend a lot of their week ensuring that the crops reach tables across the estate. The gardens were established 23 years ago with the help of the University of New South Wales and the Community Education Development Program and the City of Sydney. “Just about every variety of basil is grown, we grow virtually all the herbs that you can grow in Australia, vegetables and flowers and some berries,” Richard Weeks, President Waterloo Estate Market Garden said. The gardens did include two mango trees until some workers confused them with trees marked for destruction and cut them down by mistake. “Twenty three years ago when this was set up and many people came here in their early thirties and forties and still have plots, but as they got older their diets changed in terms of vegetables and they have become dependent on the gardens,” Richard Weeks said. The gardening members pay an annual fee to cover the cost of insurance and the replacement of tools and equipment such as hoses and new seeds and plants. The produce not used by the gardeners is either given away to friends and neighbours or sold at a market on the estate every Friday. While cars are not banned from the estate, most people prefer the use of cheaper and more usable bicycles that has led to the long running Bicycle Group. The Club also teaches estate residents how to repair and maintain their bicycles and give donated bicycles out to people in need of them. The group also operate a recycling shop at the back of the Marton Building where donated goods are repaired and then sold with the money being allocated to charities on the estate. 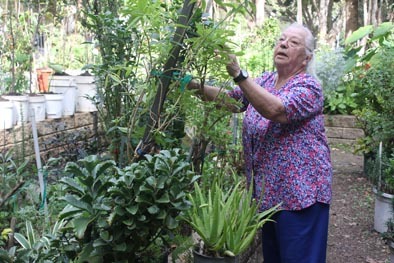 Mila Seredenko is another long term estate resident and a member of the Jewish Ladies’ Group for women in their seventies to nineties and has been operating for over ten years. “One day last week it was 17 people and another day it was four, depending on what people are doing,” Mila added. The group also has a reading day where they go out and talk about the books that they are reading. Other groups on the estate takes to the more traditional bingo and lunch and there is even a knitting group for the more leisurely inclined. While the estate is well served by medical services, the problem is that they tend to be nine to five during week days, which many in the community find limiting,so the estate has developed its own response. “The services that people are creating here themselves, they are treating from their own ideas and this not only generates a path for people to follow in the future, it keeps people young,” Richard Weeks said.